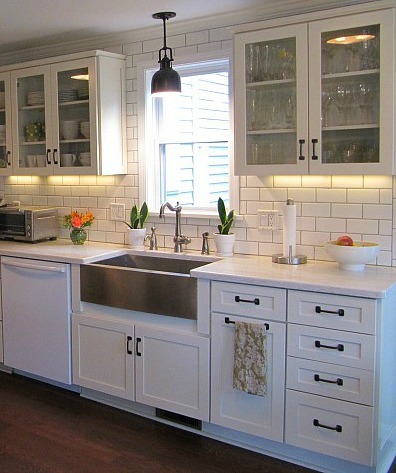 LeAnn’s white kitchen already had a lot going for it–subway tile, hardwood floors, and a farmhouse sink. But she loves color and wanted more of it in the room. She also needed a way to display more of her fun vintage finds. 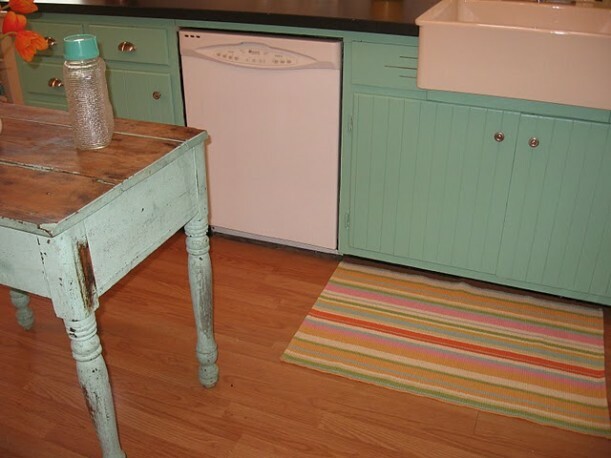 So she painted the lower cabinets turquoise and removed some of the doors from the upper cabinets. See the cap on that vintage water bottle (above)? She says that was the inspiration for her cabinet color. That is OH SO FUN! Definitely a “feel-good” kitchen. .-= lindsay´s last blog ..They can do no wrong… =-. This kitchen really reflects her personality now! I appreciate her boldness in making it her own and not being afraid of color. I’m kind of digging the colorful curtain she’s got next to the door…it really pulls all the colors together (along with the rug). .-= Courtney @ Nesting Instincts´s last blog ..I’m BAAAAACK!!! =-. .-= Julie Harward´s last blog .." GIVE- A- WAY "…and Is It Spring Yet? =-. She did a great job bringing in color and I love the orange, which really surprises me since I lived through the 70’s. Her choices are very refreshing colors. great freshin up! that’s all it takes sometimes, sometimes not tho! .-= Annie view on design´s last blog ..St Kilda style by the beach =-. Beautiful! I love the punch of color, it did wonders for the space, great job!! I liked it before, but I like even more with the color! Never would have thought to do that–and I LOVE her table. How could anyone throw that away?! .-= Amber´s last blog ..Letters from readers =-. Cute! It must be so fun to shop for that kitchen! .-= The Little Red Shop´s last blog ..The Cowboy Scoop… =-. I want to paint my kitchen cabs. They are in good condidtion except very scratched up and seem to have a high gloss on some. Do you think she sanded first? So cute. I think I love this kind of little kitchen even more than a big, perfect somethingsgottagive kind of kitchen. If I were brave enough, I would paint the white island in my all white kitchen a color like that. Maybe one day when I’m reeeeallly tired of the white. .-= Tracy @ Comfort&Luxury´s last blog ..One Show House, Two Kitchens : Part 1 =-. I love the color choice and that darling primitive table ties the whole look together. Love it! I’m glad to see that pet food dishes are permanent fixtures in someone elses kitchen. .-= Robin´s last blog ..The Yard at the Cape 2010 =-. It was a great kitchen before, but now it looks so cheerful. I would love to be in that kitchen. Love the colors. What a fun colorful kitchen. I love it. .-= Kim´s last blog ..AND THE WINNER IS !!!!!!!!!!!!!!!!!!!!! =-. Absolutely love it! Those curtains are PERFECT! .-= pattie and allie´s last blog ..Our First Giveaway Part 2!! Foodie Friday Meatball Salad =-. .-= LOVE WHERE YOU LIVE´s last blog ..Church to Home =-. I’d like to see the top cupboards painting to match the lower, and some color on the walls (perhaps a very light version of the cabinet color). .-= Catherine´s last blog .. =-. It is amazing how such little changes can completely transform a space. Taking off the cabinet doors actually made the room look larger also. .-= Becky @ Farmgirl Paints´s last blog ..Our first glimpse =-. This kitchen reminds me of the one in my grandmother’s house in rural Virginia. I can smell the collard greens cooking on the stove! Love the color on the cabinets and that curtain is fabulous! .-= Deidra´s last blog ..Free =-. Oh thank you Julia so much for featuring my little kitchen. It does make me extremely happy:) Someone asked if I sanded the cabinets, I lightly sanded them and then primed them before painting. .-= LeAnn´s last blog ..Creative juices….where art thou??? =-. What a fabulous kitchen! LOVE the punches of fun color–and that island is just perfect for the space. Nice job, LeAnn! .-= Black Eyed Susans Kitchen´s last blog ..NEW ETSY SHOP…AND THIS TIME IT’S MINE! =-. Simply charming! I love the blue! .-= anna see´s last blog ..Monday Can’t Come Soon Enough =-. Love how the curtains pull it all together. Very fun and funky vibe! .-= Janet´s last blog ..CHEAP "ART" =-. .-= Anna´s last blog ..Wordless Wednesday =-. .-= Nienke at Revel´s last blog ..3 times the fun with Udon Noodles =-. I feel like I’m at a beach house. It makes cooking look fun and relaxing. Good job. If she ran her ideas through her friends I bet they would have tried to tone her down. It shows confidence and perseverience. I get so tired of beige on tan with accents of mocha. Love it! And I love that table, what a lucky find. I can’t believe anyone would throw that treasure out! The little table definitely steals the show. I can’t believe someone was going to throw that away! 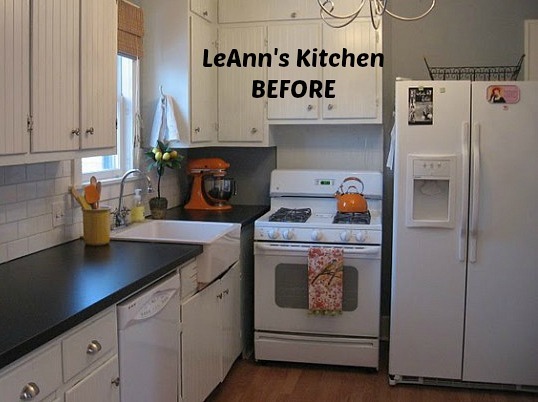 What a wonderful feature on our friend, LeAnn’s fabulous kitchen! Her spirit shines in this redo and is reflected throughout her whole house – which I adore. Thank you Julia for sharing… you are awesome. .-= Daisy Cottage´s last blog ..Weekend Fun & A Special Request =-. .-= Vicki @ In The Sandbox Comic Strip´s last blog ..Spring Break Camping Trip =-. Perfection! I LOVE an all white kitchen, but what I love more is a kitchen with personality like this one. What a great job! I have a table similar to the one she rescued. Mine is much longer, my mother called it a farm table. It sits in my garage, I have no where to put it, but I won’t get rid of it! I just know someday, somewhere that I’ll be able to use it! I really love this and I’m going to check her blog. Thanks for including the paint recommendation in the post. Have a great weekend, Julia! .-= Nichole´s last blog ..Psychological Plant Problems =-. LOVE IT! I can’t believe someone would throw that table out! I need friends like that LOL! .-= Angela´s last blog ..More Pictures =-. I love what she did! It makes the whole space look like a fun place to hang out. She made something good into something great! .-= Angelo´s last blog ..Tiny change, big difference. =-. that kitchen is adorable. it is totally a kitchen i would copy! .-= robin´s last blog ..do you . . . =-. .-= Erin´s last blog ..Urban Gypsy Design =-. Beautiful! Huge impact from relatively few changes – such a wonderful color, too. .-= Struggler´s last blog ..Fashion Damage Control =-. .-= Susan´s last blog ..What Happened to Spring??? =-. .-= charm home´s last blog ..quick question =-. This goes to show that a few small changes can make such a HUGE impact. 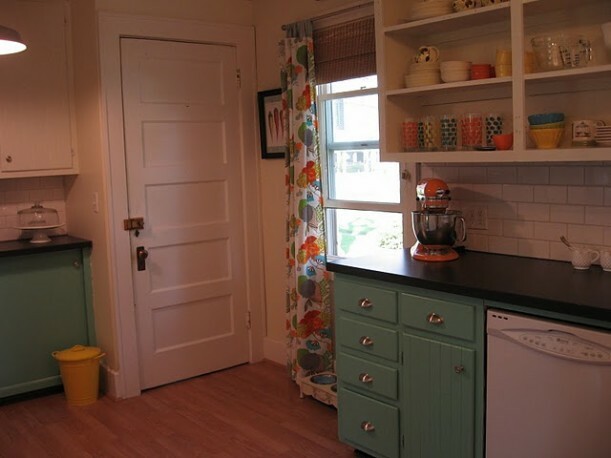 Hooray for turquoise cabinets! And you know what else I love about this kitchen? It matches your blog, Julia. 🙂 Thanks for sharing–it is so fun and cheerful. .-= angela | the painted house´s last blog ..Pop Quiz! =-. Yaay! What a fun use of color. I love this vibrant combination, just what a kitchen needs, in my opinion, since that’s where most of us tend to spend most of our time, both working and playing. .-= Minnie´s last blog ..Vera, a style maven ahead of her time =-. From non-descript to lived-in vintage. Great job. It looks like this kitchen has been this way forever and I love it. It just looks so real and functional and beautiful. It didn’t hurt that she used that lovely shade of blue. So adorable. And the way the colors are used is really amazing. I looked at the white version and thought, “why would you re-do anything, just add some splashes here and there!”… and then… TA-DA. Wow – what a fun kitchen to cook and entertain in/from! .-= The Girl´s last blog ..Meet Max =-. 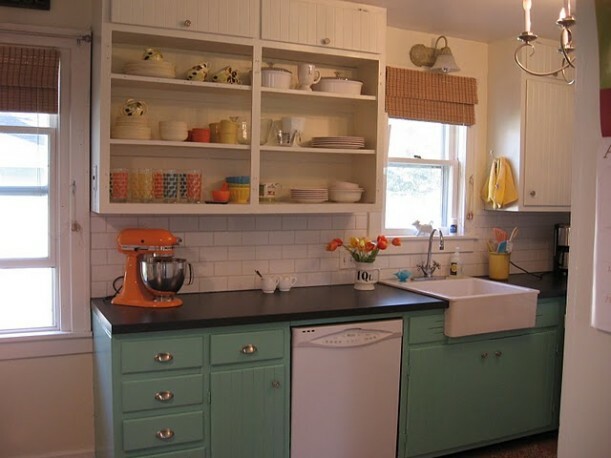 This kitchen speaks a little retro to me! Yes, fun is a word I would also use for the room! .-= Josanne´s last blog ..Simon, Once Again! =-. .-= JEN RAMOS´s last blog ..Sharing a Penthouse with a Sibling…. (D Magazine) =-. What an adorable kitchen! It’s so happy looking. Cute, cute, cute. Thanks for sharing. .-= Allison´s last blog ..Picture Wall Possibilities =-. Julia-I have always wanted a white kitchen to work around with color! Love the turqouise. The rug and the mixer were meant for each other! Thanks for sharing this! .-= Susan´s last blog ..Quick, Cheap, and Cute for Mother’s Day =-. Very nice! Love that color. It looks fantastic with the bright colors on the vintage glassware. The rug works perfect and the table is awesome. Great redo. .-= Sherry´s last blog ..Mother’s Day Centerpiece =-. .-= Sue @Rue Mouffetard´s last blog ..SATURDAY NIGHT AT THE FLEA……….. =-. 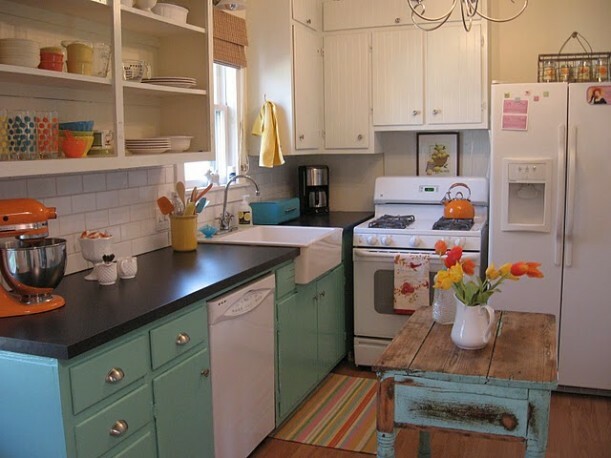 Love this little kitch redo. First I really like open shelving and that little old table is GREAT!!! The color of the lower cabinets is really nice. 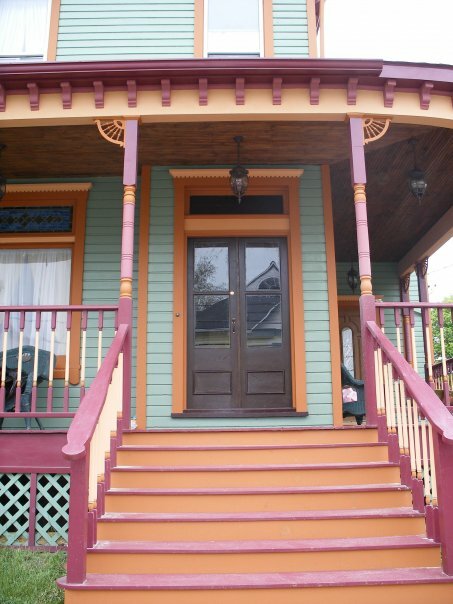 Martha S. used that color a lot in one of her houses. .-= Shirley Corwin´s last blog ..little dog =-. i LOVE it! 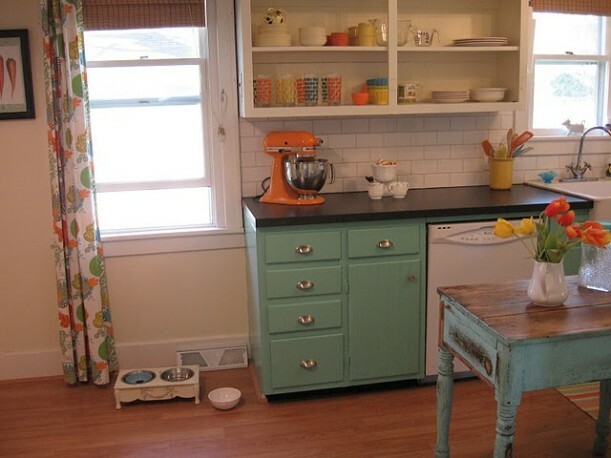 i love the color on the base cabinets- it really gives the room new life. .-= cassie´s last blog ..Little Boy Blue =-. What a difference some color makes. I love the cupboard doors removed on the top cabinets to show off the colord dishes and glasses…great touch. You’re right it had a lot going for it to begin with but she added warmth and charm. I like it better with that touch of colour. It’s a very homey and inviting kitchen indeed! .-= Lisa´s last blog ..Contest Answer: What in the world has this cabinet become ?? =-. Really like your color choices, and am laughing because a KitchenAid stand mixer featured heavily in my own link to the party today. .-= Lori @ In Pursuit of Martha Points´s last blog ..But is it Art? =-. 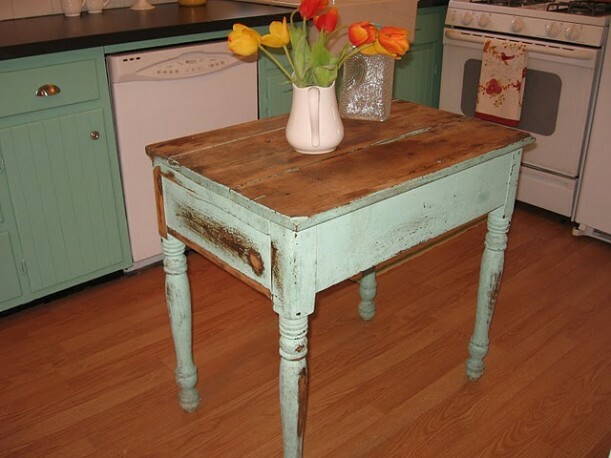 Such a great idea – I love that you picked the turquoise color! That made everything just pop. I also like the idea of taking the doors off of some cabinets. It adds so much color to the room! Love it and very reto look. I like the appliances you have. It looks like Shabby Chic, like which I said, a house shouldn’t look so precious so as to not feel that you can kick your heels off and feel great. Looks cozy, wonderful and breezy. Love it!! Love this! Turquoise is my new favorite color. Great inspiration for my future kitchen update. .-= Joselyn´s last blog ..Drawer Dilemma =-. LOVE LOVE LOVE! I would say that you sprinkled a lil’bit of Rachel Ray style in that white kitchen! I soooo want to do colors like this, but don’t know if I’m brave enough! But you pulled it off in just the right amounts! Awesome! .-= Missy´s last blog ..For the love of all things louvered and weathered! =-. Oh so tempting to call someone out to spray my bottom cabinets a fun color. .-= laura´s last blog ..Decorating with Shutters =-. no, really. holy crap. STUNNING and fun and colorful and fantastic makeover. .-= sarah h´s last blog ..The 34792th Time’s a Charm…. ??? =-. It’s absolutely amazing what a little paint will do. And then you pulled it all together with the accessories; the orange in the throw rug, the draperies and the stand mixer… it’s all in the details. BRAVO! Just lovely! I’m using this as inspiration for painting my 1959 kitchen. Where did you find the window treatments???? I LOVE them!!!! First time I’ve seen this makeover, and I have to say I LOVE IT!!! It’s so cheerfull looking, makes me want spring to come even sooner now! What is the color name?? I have been hunting for this color for awhile!! Love love love this kitchen!!! Also, how much of a task was painting your cabinets? I want to give this a try but nervous to get started!! Do you have the link to her blog? It’s the Vintage Sassy blog I link to at the end of the post (https://leannhuntington.blogspot.com). However, when I tried it today, it had been hacked by another site and was not safe to visit. Not sure what’s going on. I hope her blog is back soon!